In 1962 the Jewish Community Center of Collier County, the forerunner of Temple Shalom, was established by the few Jewish families who had arrived in the 1950’s, along with the Jewish salesmen of a large area real estate development. They held services, meetings and social events in offices, recreation halls, a parish hall, and bank facilities. In 1965 the Temple’s first Torah was donated by a visitor and his family in appreciation of the congregation’s forming a minyan so he could say Kaddish. 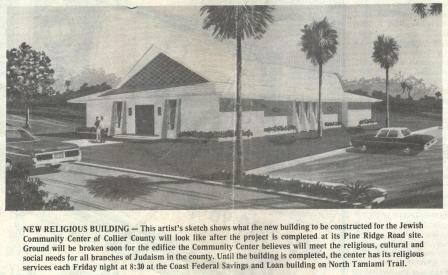 On September 23, 1966 the Jewish Community Center of Collier County was chartered by the Secretary of State of Florida. By 1970, the original founders of the Jewish Community Center of Collier County were joined by others, who recognized the need to establish a Jewish presence in Collier County, and to establish a Jewish home in the form of a building of our own. We are indebted to them for their foresight and for their dedication of purpose. Our first building was dedicated in April, 1975, when membership consisted of 57 families. From 1972 to 1974 a volunteer ordained Reform rabbi served the community, along with lay leaders and a volunteer cantor. A Religious School was established in 1972, with eight students, and the first Bar Mitzvahs were held. Services were conducted by lay leaders and a volunteer cantor until our first part time Reform rabbi, who was a retiree, was hired in 1977. On May 5, 1980 the name was officially changed to Temple Shalom, and in January 1993 we joined the Union of American Hebrew Congregations (now known as URJ – Union for Reform Judaism). Construction of our current Temple was completed in November 1991 and the first service was held on November 8, 1991, with dedication of the building taking place in March of 1992. Membership at the time was 330. Several years ago, the membership and religious school enrollment had increased to the point that we embarked on "Shalom 2000" – a campaign to build an educational wing, our Learning Center, which was dedicated on November 11, 2001. Our clergy staff includes a Rabbi and a Cantor, an organist/choir director, an Executive Director, a Director of Congregational Education and a Preschool Director, along with more than 50 Religious school and preschool teachers, administrative support, building management and custodial staff. We are 700 families strong, with 150 Religious School students and 170 preschool students.